MISSION TO MARS stands every bit as tall as CAPRICORN ONE in the Ignorant Space Movie category, exhibiting so many misdemeanors, misrepresentations, misapplied physics laws, mistaken facts, missteps, mysterious logic, and misapprehension of spacefaring dialect that one wonders which second-grader took three months off school to helm it. Brian de Palma – the dark force behind 1983’s SCARFACE – appends his name as director. But I think he’s lying. Starring Don Cheadle as the Crazy Black Guy, Gary Sinise (wearing more makeup than David Bowie on the Ziggy Stardust tour), Tim Robbins as The Tragic Apple-Pie Hero, Connie Nielsen as The Chick and Jerry O’Connell as The Fat Kid from STAND BY ME. And from there, it’s downhill fast. MISSION TO MARS is so machine-gun riddled with one discrepancy and fallacy after the next, that absolutely zero enjoyment can be gleaned from the storyline, performances or the space or planet backdrop effects. Crazy Black Guy gets stranded on Mars. Blatantly throwing logic, budget, orbital mechanics and NASA protocol to the pigs, Apple-Pie, The Chick, Fat Kid and Ziggy are sent to rescue him. Another “launch window” to Mars is years hence, yet these American Pie Heroes – working on the fact that everyone in the film and the audience regard the launch window as a McGuffin – go anyway. Launching outside a “launch window” is not a “dramatic element that illustrates dedication and Team Spirit” – it is an impossibility. Without gravity assists (by flybys of Venus and Earth), a spacecraft already constructed for such a journey would have to be retrofitted to house inordinate amounts of additional propellant, construction exigencies alone putting the mission outside budget and payload constraints… No one can just declare their heroic intentions and have everything ready to go by Sunday – which is basically how Ziggy achieves his launch; to save someone openly considered dispensable by the space agency (who train scores of astronauts for the same missions, for just such eventualities), who may be a corpse anyway, considering all radio contact with him was lost. You lost me at Houston, We Have a Problem. 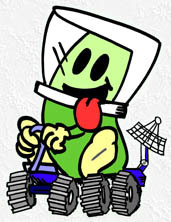 NASA would more likely launch a mission to retrieve its ROVER, which has more intelligence in its antenna than all the astronauts combined. Our rescuers discover a giant Face on Mars – that old 70’s superstition from the Viking 1 probe photo. In a space age where we have already disproved its existence, the film-makers opt to pander to conspiracy theorists, pseudo-scientists, astrologers and imbeciles who shun scientific evidence like the mystical “evil” they have been inculcated to believe is tangible. 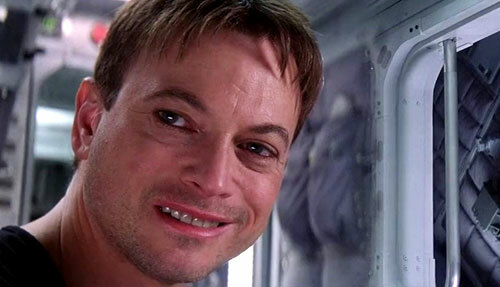 In a technological era that possesses extraterrestrial soft-landing spacecraft (Mars Pathfinder, launched 1996) and high-altitude surveillance (Mars Global Surveyor, launched 1996), given the fictional year of this movie (supposedly 2020), even if we need to regard The Face as “real” for the movie’s dramatic purposes, it should have been discovered decades before these astro-nots landed. Instead, the movie ramps further into idiocy. With Pie’s MMU (Manned Maneuvering Unit) out of fuel, Chick, supposedly a trained astronaut, uses the same incorrect directional jet burns and massive overacting to try to save him. Pie tells her, “You can’t catch me with your MMU, honey. Their jets are designed for attitude control, not travel.” Information which probably should have been learned at the Astronaut Academy, dontcha think? After the mathematical impossibility of saving Pie is explained to her like an idiot-child, she stops and – shoots a tether cable at him! Remember that silly thing we learned in grade school called Newton’s Third Law of Motion: “For every action, there is an equal and opposite reaction”? Taking for granted that Chick has miraculously attained orbital velocity of 28,000 kph, after shooting the tether, she retains her relative position, steady as a rock, in the vacuum of space – breaking one of the most fundamental physics laws, while everything else around her continues to adhere to those same laws! 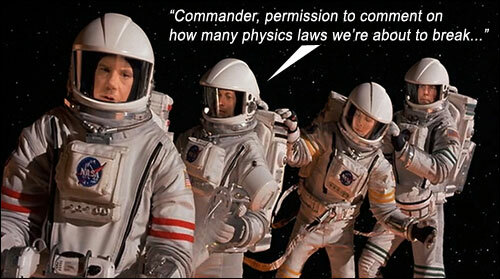 No one told Newton that enough overacting piled on the Third Law would negate its physics. Speciously landing on Mars, Crazy Black Guy is found (spearing fish and talking to a volleyball named Wilson), whereupon ensue conversations about DNA that only a screenwriter with absolutely no biology knowledge could appreciate. Their super-redundant rover leads them into the Face on Mars, where they encounter a tall alien being wearing a flowing number that would look fabulous on Barbra Streisand. Barbra shows them a solar system hologram – with all the planets orbiting in the wrong direction (proving that there are idiot screenwriters even on Mars) – and a nifty morphing computer program which she bought from Michael Jackson, showing that Life on Earth was seeded from Life on Mars. Well, that accounts for all those Jerry Springer guests. Every aspect of the DNA scenes, zero-gee scenes and orbital mechanics scenes is completely blundered from the dialogue to the action to the fallacious physics laws which go in and out of play as the plot requires; spacecraft do not emit vapor trails; sound does not propagate in a vacuum; galaxies don’t look that way in visible light; the atmosphere analyzer on Ziggy’s forearm shows “Nitrogen 56% Oxygen 20% Trace Gasses 1%” – the film-makers are so lazy that they do not even bother to make the numbers add up to 100 percent! Movie writers always hide behind the pretext that movies are “only entertainment” and should be taken less seriously. Yet what kind of entertainment can be gleaned from a movie with this much blatant disregard for the most basic tenets of reality (such as: Humans Can’t Breath On Mars)? Why should society extol education and learning when this demeaning and insidious disrespect for learning is lauded with heathen funding and absolutely criminal promulgation? If they say they are appealing to “the masses,” how much of an insult is it to regard The Masses as this imbecilic? Unfortunately, there will be many who, being too young or underprivileged to have afforded an opportunity for education in basic physics, will enjoy this film – and thus the dumbing down of a generation acquires its target long before that generation even knows what hit it. Every scientific fact that mankind has strove so hard to identify is treated like so much dross by the ignoramuses who forged this worthless and useless, deformed, retarded thing they call a movie, that their greatest punishment will be having to see their names attached to it for millennia to come. Writers: Lowell Cannon, Jim Thomas, John Thomas, Graham Yost. Starring: Gary Sinise, Tim Robbins, Don Cheadle, Connie Nielsen, Jerry O’Connell, Armin Mueller-Stahl. The hands-down best book for a non-technical audience, covering orbital mechanics, spacecraft launch procedures, worldwide space programs, and the Mercury and Apollo missions. Consistently entertaining, lavishly illustrated, Lee is like the Carl Sagan of NASA, elucidating complex processes without speaking down to his audience.